I think it’s important for stay at home moms to earn money when possible. Doing this has gotten my family through some tough times in much better financial condition than we would have been in if we had relied on my husband’s income alone, especially when he was laid off a few years back. He found work again after a few months, but it would have been pretty awful if I hadn’t had an income to contribute. 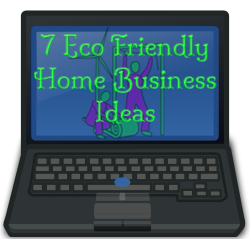 At first glance, it’s pretty easy to make a blog eco friendly. You can even choose a hosting company that uses renewable energy or otherwise makes an effort to be environmentally friendly. Beyond that, it’s the computer you use, and not much other equipment most times. But if you get to where you can earn money from your blog, the next aspect comes into play: keeping your product recommendations green. There are plenty of companies you can choose from. I usually sign up through affiliate programs and choose companies that focus on eco friendly products, or carefully chosen products on Amazon, that being the biggest selection. Especially if you’re blogging about being eco friendly, it’s best to lead by example. Will you get it perfect? Probably not, but you can put in your best effort. You don’t have to run a blog to be an affiliate marketer. You can set up a website and just list eco friendly products for sale. You will want to make sure that your site stands out from others – using the same description as everyone else won’t make your website stand out from others. Now this one can get really tricky. You wouldn’t necessarily think so, but sometimes it’s really hard to be certain that a company that claims to be environmentally friendly really is, especially when it’s hard to find out what ingredients are in their products. Here are a few companies to consider. Review them for yourself and see which meet your needs best. There are of course many more than these. If you’re good at repurposing old stuff, you can sell it. Etsy and eBay are easy choices, but you can also open your own online store using PayPal or another payment processor. If things take off for you, you will need to find resources for items to repurpose. Use eco friendly supplies, and make products you can sell. Once again, Etsy and eBay are pretty good choices. You can make just about anything, depending on your skills – clothes, toys, reusable bags, and so much more. Here’s for you gardeners. It will take some time to find out what rules you’ll need to follow in your area to legally sell produce, but if you have a really successful garden you may be able to sell your excess. Farmer’s markets can be a great choice. Of course, it doesn’t have to be fresh. If you make jelly or preserve your produce, you can sell that too. Make sure you know the food safety laws for your area. You’ll probably have inspections to deal with and may have to rent a special kitchen to work. You can help others go green. A green consultant can help businesses or individuals find ways to be more eco friendly. You might check buildings to see if they’re energy efficient and recommend products. You might even help them plan events. This may take some training, as you probably can’t just walk in and recognize problems otherwise. Before you start any business, check with your city to ensure that you can do so legally. Home businesses are often legal if there’s no impact to the residential area, but rules vary, especially by the type of business you open. Sometimes all you need is a license, sometimes nothing at all, sometimes much more. Your life will be much simpler if you know what’s relevant to you. Much as I enjoy going through the huge selection at Amazon , there’s something to be said for supporting smaller businesses, especially green ones. So today I decided to look around at some of them. Great fun for those who love to give handmade gifts. They won’t necessarily be green, but many will be, and you’re buying from the person who made the item most of the time. Etsy has gift for all ages. Lots of the crafters make toys. Lots of them make home decor, jewelry and so forth. Merchants at Etsy set their own prices. They pay just 20 cents to list each item, then a 3.5% transaction fee for each sale. That’s a much better deal than what people are getting from eBay these days, where you pay an insertion fee based on your starting auction price, then 8.75% of the closing price for the first $25, less as the price goes up. You can also of course go to local craft fairs if handmade is what you enjoy giving but want more than what you would make yourself. This company offers reusable bags and more. They have great shopping bags and lunch bags. You can also find Sigg, Klean Kanteen and more for family and friends who could use to drop the buying bottled water habit. Green for all around the house, apparel, pets and so much more. More products for around the house. Also sells a range of air purifiers and water filters. Products for your home, pets and family. Very good range in the selection. Rechargeable batteries make great gifts for parents you know or anyone who really loves their technology. Just think of how many batteries iPods and such can go through! A good recharging system is an excellent gift for most families these days. Ethical fashions for men and women. Prices go from “not bad for eco-fashion” to rather high. Skin care, bath products and more, with ingredients that include aloe vera and jojoba. Promises organic skin and body car products that don’t use parabens, phthalates, alcohol, synthetic fragrances, or animal testing. Skin, body and hair care products made from natural ingredients. Woman owned, family operated. They offer skin and personal care as well as products for cleaning around the house. Help to preserve garden biodiversity by giving your favorite gardener heirloom seeds. The selection is delightful. Let’s face it – the younger a child is, the less likely he or she is to understand the fuss about green in the first place. It’s also a bit easier to find green toys for children young enough to enjoy wooden or cloth toys rather than electronics. This site has a great selection of toys to encourage creative play. You can go through the toy selection by age group, going as far as ages 9 and up. They have play silks, natural fiber dolls, kites and quite a bit more. Not strictly green, but they have great classics such as LEGO, K’Nex and Lincoln Logs. Great selection of nonelectric toys that should encourage your child’s imagination. A focus on natural, wooden and organic cotton toys for children. They also donate 1% of each sale to land conservancies right now. Wooden toys with a focus on quality. They offer toys that encourage imaginative play and will last for years. For the pet lover in your life. Natural and organic pet foods and toys. Gifts don’t have to be something just for the person you’re giving them too. There’s a great article on gifts that make a difference over on Eco Child’s Play.